The Foundation for Technical Education in Iraq wanted a world-class development model for its College CEO's (Deans). It drew from the UK's acclaimed leadership development programme for College Principals. The Foundation wanted to move from top down, centralised control to more flexible management focused on meeting the training needs of local employers and areas. This is being achieved against a background of national security problems, political change, economic challenges and a patriarchal culture. Few leaders face such complex challenges or ones which test their courage and resilience. The leadership programme was intended to have impact on the vocational education system of Iraq as a generation of leaders redesigned the way leadership is practised, to the benefit of stakeholders, students and employees. Wider national economic impact would be achieved over time as Deans focused their Colleges and Institutes on innovative ways to respond to the emerging needs of employers. Tony's children remark that ‘all we ever hear about Iraq on the news is bad stuff - why aren’t we hearing about the Dean’s programme?’ We hope this narrative opens a window on a very special group of Iraqi leaders taking responsibility for creating their new future. The Foundation is based in Baghdad and is the government agency responsible for technical Colleges and Institutes throughout Iraq, apart from the Kurdistan region. It has over 72,000 students and 14,000 staff in 40 Colleges and Institutes. Since the end of the liberation in 2003 many of their buildings had to be reconstructed and all had to be re-equipped after looting. Some have been repeatedly targeted for attack by insurgents. Deans have faced attempts on their life. The existing system of technical education is highly centralised, working under the auspices of the Ministry of Higher Education. Iraq was pre-eminent in the region for education and training but after 1980 this all changed and it now suffers from educational deprivation, high drop-out rates from schools and 40% adult illiteracy in rural areas. Foundation President Dr. Mahmood knew that his senior leaders needed new models of leadership to help them cope with the uncharted waters of post -liberation Iraq. He also knew that these models should be adapted to the Iraqi context and culture. He has shown vision in seeking to redefine the work of leadership and wanting to place leadership power locally to be able to respond to local needs. This has challenged the traditional approach to command and control and benevolent patriarchy which is common throughout the country. Dr Mahmood recently said of the Deans Qualifying Programme (DQP) ” We strongly supported DQP from the start. This is an accredited programme which is helping Deans achieve our vision to strengthen the Iraqi economy through local communities. DQP is helping professionalise our senior management”. Once the 2003 war ended, vocational education was presented with the opportunity of re-connecting with the outside world after 30 years of isolation from new ideas and embargos of economic development. But as the country descended into post-war chaos, colleges were stripped by looters. Colleges faced the challenge of equipping young people and adults with the vocational skills desperately needed to rebuild local economies. Society was divided and infrastructure decimated. Few leaders ever face such challenges in their lifetime and Rawabit (arabic partnership) has been a lifeline to Iraq’s Foundation for Technical Education. Rawabit was set up in 2004 by the Iraqi FTE, a group of UK FE colleges, the Association of Colleges and other UK agencies. It subsequently attracted funds from the UK government (now Department for Business, Innovation and Skills) and UNESCO. More than 600 senior managers and staff from across Iraq (including many women) have benefited from practical programmes to raise skills, develop strategy and make the curriculum more responsive to market needs. Many of these have visited the UK on study visits to twinned Colleges in England and N. Ireland or attended conferences in Istanbul or Jordan to share two-way learning and exchange ideas. The experience of N. Ireland resonated deeply with Iraqi colleagues who are working to overcome sectarian, political, tribal and religious divisions on their campuses. Iraqi colleges have supported former insurgents and prisoners to leave violence behind and learn trades to channel their energies productively. In 2009 Tony was running the UK's leadership programme for Principals of Further Education Colleges. One of the UK participants was Iraqi-born Ali Hadawi CBE, who was vice-Chair of Rawabit . Ali shared with Dr Mahmood how his own leadership had changed as a result of the programme he attended. Dr Mahmood brought to England a group of policy makers and Tony spent two days with them explaining the leadership programme and discussing how it could be contextualised for them. He showed a video clip from the film 'Pay It Forward' (link is below) in which a teacher talks to his class about what do do when their world is a big disappointment. The clip resonated with the group who shared that what Iraq needed right now was 'hope'. This was their big leadership challenge. DQP is helping Deans embed hope within the vocational education system. Tony was humbled to listen to their personal stories of saying goodbye to their families each morning, never knowing if this was to be their last day on this earth. They were seeking to make a difference in the lives of students, de-politicise their campuses, resolve tribal disputes, manage student accommodation, achieve high educational outcomes...... and survive one day at a time. 'Insha'Allah' (God's will) was never far from their lips. Tony was drawn to these dignified, gentle professionals who simply wanted to learn about leadership. Tony set about designing a pilot programme for nine Deans as a priority Rawabit programme under the wing of the UK Association of Colleges. It was funded by the then Department for Education and Skills in England and UNESCO with some match funding from the Foundation. Dr Mahmood wanted a programme which was robust and externally accredited. We used assessors from the UK programme to validate the written assignment from each participant. Tony also established a unique partnership with the Chartered Management Institute so that successful graduates of DQP would be assessed to become Chartered Managers. This was the first time this external accreditation had happened in Iraq. Tony talked to anyone he could find with experience of leadership development in the Middle East, or of living or working in Iraq. Despite avid research he discovered a paucity of published material on leadership in an Arab, let alone Iraqi context. He attended the Leadership Trust Foundation's first Worldly Leadership Conference on non-western forms of leadership wisdom. The content of the 16 month programme included taught elements on high performance working; change leadership; engaging with external stakeholders; innovation culture; motivation; and coaching skills. We included an experiential learning workshop to stimulate peer feedback and self awareness. Participants were also required to undertake a 360 degree feedback process ( using the Leadership Audit from the Leadership Trust). They had to prepare a personal leadership development plan and also manage a change project in the workplace. They submitted a 5000 word assignment on their leadership learning. Almost all of this approach was new to the Iraqi culture in terms of content. 360 peer feedback was unknown as was reflective leadership practice and coaching. In order to be a source of useful learning for Deans every aspect of the programme needed to be contextualised for a Middle East, Arab group. This contextualisation took place beforehand when possible but in the pilot often occured as a 'work in progress' in the classroom. 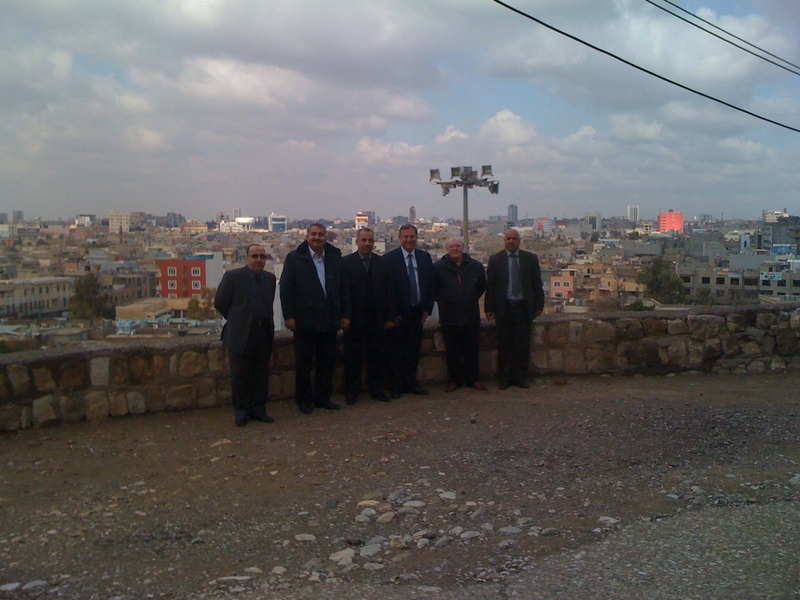 As tutors we quickly realised we were on as steep a learning curve as our Iraqi colleagues. Dave led a workshop on the 'Change House' whose title greatly amused the delegates - who later told us that 'change my house' in Iraq means to change your wife!! Iraq had been isolated from the outside world for decades and during the programme (which ran from late 2009 to early 2011) we discovered that Deans had been raised on didactic teaching methods. Our informal style of learner-centred delivery was ground breaking for them. In our research for the programme Dave and I learned that Iraqi Arab culture is highly relational. We determined to concentrate on building strong, trusting relationships. We chose not to drink alcohol at shared mealtimes (despite the insistence of Deans that they were comfortable for us to do so). We listened to their stories and tried to understand their working lives. The programme started with a two week induction in England and we found that delivery was significantly slower-paced due to the need for translation and time for participants to discuss unfamiliar theories and concepts. Delivery continued in Istanbul and then moved to residential modules held in Erbil in Northern Iraq. We saw a deepening of the relationships the further East we travelled. Once we entrusted our welfare and safekeeping to our Arab hosts in their own country we noticed a shift in the nature of those relationships. We were being described as ‘brother’ in e mails. Deans shared more personal information and views. The bonds were enriched through trust and mutual respect. We took every opportunity to honour the heritage of Iraq by making links to its culture and history. The oldest known writing in the world is a Sumerian clay tablet found near Babylon – and it contains a leadership parable making this the oldest recorded leadership wisdom. Erbil Citadel is the oldest continuously inhabited settlement in the world. We were working with people from the land of the Tower of Babel, city of Nineveh, and great biblical figures such as Noah, Abraham, Daniel and Esther. It was from Iraq that three wise men travelled to find a baby Jesus. Tony "determined to honour that past, reconnecting Deans with their own leadership heritage, whilst introducing new thinking" (Developing Leaders Issue 5 2011). We had intriguing discussions about the Qur'an and the role of faith in leadership. Spirituality is an inseparable part of Iraqi life and leadership. The five calls to prayer reminded us of this daily. We gave each Dean a copy of ‘The Leadership of Muhammad’ (now published in Arabic) by Prof. John Adair, Chair of Leadership Studies United Nations System Staff College , who has been following this programme with interest. Iraq’s isolation under sanctions had decayed the research skills of participants and independent study was made harder due to the loss of so much of the country’s infrastructure. Information resources, libraries and internet access were patchy and unreliable. Power cuts were a daily occurrence. We discovered that Iraqi groups work very differently to English ones. A group leader is appointed in Iraqi culture and members defer to him. There is more collaboration and spontaneity and the search for ’wisdom’ in shared tasks is a group endeavour rather than an individual learning outcome. Verbal story telling was a natural teaching medium for our Iraqi friends. This was very useful whenever our modern technology decided not to work! Feedback as we knew it was totally unfamiliar. The dominant cultural norm is to preserve ‘face’ (dignity) and so the default in feedback was to the positive aspects. Negative feedback to one another, to a participant or even to a tutor was perceived as someone losing face. It took time to be able to give and receive personal feedback which could be seen as truly developmental. We worked on the principles of ‘small steps’ and ‘direction of travel’. The preferrred learning style in an Arab setting values small group discussion and paired work. The quality of feedback was inverse to group size – the smaller the better and pairs or one to one worked best. The Deans had grown up in a leadership culture which was command and control, underpinned by patriarchy with tribal affiliations. Most had learned to keep their opinions to themselves - to keep their heads down to avoid trouble or personal disaster. Those with prior Western contact demonstrated more subtle leadership styles. Our pilot group were mainly engineers and scientists typically educated to PhD level. Their academic curiosity allowed them to make new connections out of seemingly disparate leadership models we were teaching them. We were concerned with evidencing applied leadership learning. Dave devised a three level model when it became evident that most Deans needed to move out of description of theory (Level 1) to evidencing the impact they made at work (level 2 and 3). Level 2 - Thorough understanding and application of DQP materials/models/theory. This is a piece of writing/explanation which reflects on applied practice in context. Level 3 - Adaptation and modification of understanding of DQP materials/models/theory. This discusses the underpinning rationale for the experimentation and is an advanced piece of writing/explanation. It is the deepest level of learning. Assessors Gaynor Thomas and John Sephton contextualised and triangulated the evidence offered to reflect the unique setting and challenges of Iraq. Gaynor said “We learned so much about what is happening in Iraq and the leadership and management Deans have had to exhibit in such very complex and difficult circumstances. What they have achieved is most impressive and it was very clear how they had successfully applied the models and concepts learned on the DQP in their Institutes, which have successfully blossomed under their leadership”. Deans shared their stories of creating business impact including de-politicising their learning institutions; stabilising local communities through vocational education amongst former insurgents and prisoners; introducing new vocational and academic qualifications to Masters/PhD level; rebuilding Colleges destroyed in terrorist activity. They have experienced personal attacks yet demonstrated resilience, patience and faith. Gaynor commented “The most impressive stories were those of rebuilding the human soul”. One Dean described the experience of leaving Iraq to attend the first DQP module in the UK as “walking through a very dark tunnel facing the headlights of oncoming cars, (which causes) a temporary blindness…. therefore we will need time to comprehend the lectures”. He felt that the extraordinary conditions of Iraq would hinder the application of some theories. DQP ‘”was an injection of energy to boost our hopes and dreams and gave us the opportunity to forget a lot of the worries that have accompanied our work throughout the dark period that we went through”. A third Dean had to work on two stages; firstly to restore the Institute which had lacked the most basic supplies needed to sustain its role, and secondly to rehabilitate the ‘infected human soul’ which was destroyed by what had happened. The first task he says was rather easy, but the second task was much more difficult to achieve. “What had happened in our country resulted in people lacking trust or faith in any leader; they were accustomed to the bureaucratic officials who are chasing after their own interests. Under the previous government public sector jobs were very badly paid; hence people had lost their interest and had no enthusiasm for working in the sector. Also they believed that whether they performed well or not, they would be paid the same (very modest wages) by the end of the month: therefore there was no incentive to work in the Institute. “The majority of workers who had suffered the frustrations of the past have found it difficult to improve; clearly this caused problems for the Institute as they were unreliable. However after a period of time working with them, staff who had been in the “Denial Room” started to gradually transform when they realized the importance of the process to the Institute and that its success was dependent upon their involvement. I have been able to help them change by restoring their confidence in management, by encouraging them and rewarding their achievements by offering them incentives”. Management of people in unstable circumstances such as Iraq is extremely difficult. The robust nature of assessment, using external accreditation, assured the quality of the applied learning whilst on the programme. The programnme also developed leadership standards with the Foundation. 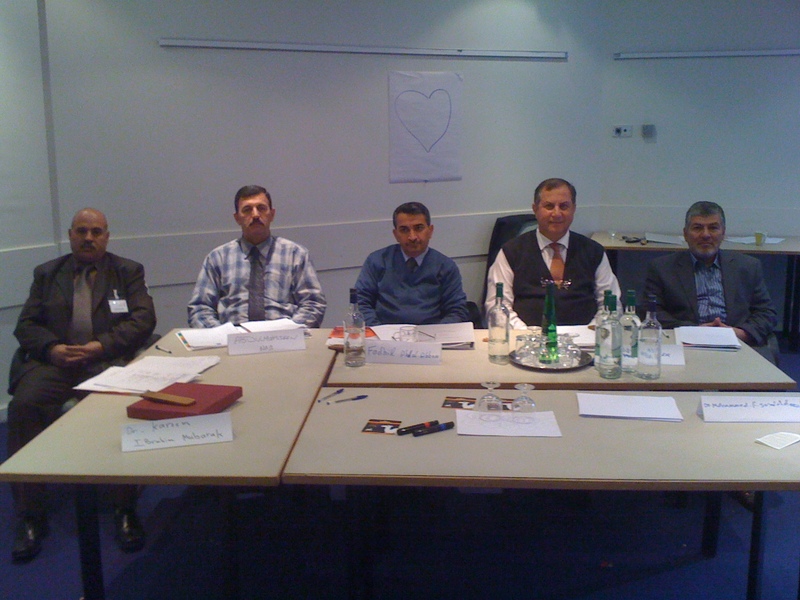 The nine Deans were all trained to be able to coach future participants on DQP, thus building organisational capacity to support an Iraqi-led wider roll out of the programme. Four Deans were selected to undertake assessment of written assignments.The leadership competences used were to the highest UK standards. Wider roll out commenced with the induction week in Iraq for cohort 2 of 26 Deans and Vice Deans (including the first female Dean) in November 2011. This cohort embraces delegates from across the whole of Iraq including Kurdistan, now involving all three Foundations of Technical Education in the country. The programme has received attention from The Sunday Times and the international journal Developing Leaders (copies of these articles are attached below). DQP has recently featured in Iraqi TV, press and radio interviews networked acorss the Gulf. The programme was evaluated to draw out the learning and lessons and this report is linked below. Tutors need to establish credibility with an Iraqi group – but this is more than professional background, qualifications and relevant experience. It covers working with trust, dignity and respect at all times. We learnt to empathise with cultural difference and to research and reflect on cultural imperatives. Building relationships takes time and is a layered process – for example we experienced a deepening bond each time we visited Iraq. This was a function of entrusting our personal welfare to the Deans as well as them being able to showcase their country to us in the enchanting and charming way Arab hosts excel in. We think it empowered the Iraqi Deans to take responsibility for us. Planning is good but we learned to increase our personal flexibility – working ‘in the moment’ rather than to a fixed idea of what had to happen next. This is how Iraqi culture works. Delivery took twice the time it would with a group of English Principals because of the need to work with in-group translation and also to allow time for the group members to discuss new concepts and theories. This meant a need to adjust the pace, adapt content and avoid colloquialisms which only served to confuse. We learnt to assume nothing – we repeatedly discovered aspects of Western leadership development which are not present in Iraqi culture. 360 feedback is new territory; corroboration of evidence of impact is unknown; CVs are set out differently; management theories we would regard as foundational are unfamiliar. We will prepare a management and leadership introduction for future cohorts. The role of a group leader in Iraqi culture is quite different to the Western model. The group leader has authority over a group’s behaviour and direction which is palpable. It is therefore essential to understand and acknowledge this, consulting the group leader for all important decisions and briefing them ahead of modules and key activities. Sometimes the dialogue in class is solely with the group leader – with others listening in or occasionally contributing. Deans make lateral connections across leadership models and theories (whereas English Principals tend to drill down into one particular model to examine it in depth). Deans could then create a new model out of the inter-connectedness. This was outstanding conceptualisation. Feedback flows differently in an Iraqi group. It firstly depends on the level of trust present (as in the UK) but even in high trust groups it defaults to discussion of the positives and avoids anything which might be seen as negative. This protects the ‘face’ of the hearers or facilitators. Reframing developmental feedback to ‘it would be even better if…..’ could sometimes help. The quality of feedback was also in inverse proportions to group size – small groups worked better than large ones; pairs better still and one to one feedback from the tutor gave the greatest scope for discussion of ‘negatively perceived’ issues, subject always to obtaining the permission of the hearer and watching closely for non-verbal reactions which might indicate psychological distress from feedback. Dr Mahmood – whose vision for DQP provided the ‘igniting spark’ for the programme and whose ongoing sponsorship has affirmed its high priority within the Foundation. You are a ‘father ‘ to DQP. UK Principals Ian Peake, Paul Hafren, Maureen Mellor, Matt Atkinson and Sue Rimmer - who provided a week of leadership shadowing in their own Colleges. Chartered Manager assessors Gaynor Thomas and John Sephton – who coped with uncertainty, date/venue changes and assessing in unfamiliar circumstances. Your empathy and warmth was exceptional. DQP assessors Reg Chapman and Howard Petch – your insights, challenges and developmental feedback have been a gift to the programme and the Deans in particular. We have deeply valued your wisdom. I have read the whole story you give here and even looked for extra resources to it, in order to provide a complex data synthesis for a case study project assignment I have to do on my organizational management degrees this semester. In order to enhance my knowledge, I am constantly reading about new management paradigms, how they have been implemented in companies and how efficient they turn to be over new assessment methodologies. I still think, as a basic view, that the manager or the leader must be the one person that is not afraid of change in a company. I am glad you found the story helpful. I think that many leaders find change very stressful or even frightening at times - it is how they respond to their own emotions which is important. Being self aware is a start and then building in support systems perhaps of trusted colleagues,peers or an external coach to help them make sense of the changes and their own reactions or anxieties. The leader needs to learn to manage their emotions of fear but showing some level of personal vulnerability can ironically make them a more credible change agent as it is seen that 'we are in this together'. Hearing the progress of the programme from Tony and Dave over the last few years has been inspirational, but reading it here as the full story is even more incredible. The leadership journey of the Dean’s and the challenges they face is deeply humbling. Tony - it’s so interesting to read about how you and Dave adapted your approaches to be ‘in the moment’ and used coaching methods to create a reflective approach to leadership. Tony this project has been inspirational and from a humanistic stance, truly hopeful work. Clearly your level of commitment and respectful approach to working in diverse and challenging settings, has show great rewards. An inspirational story which puts into context our own "local" leadership challenges! Your findings made me think about the importance of lateral connections and our collective fixation on short term outcomes rather than a true long term plan. Maybe this needs to be given more attention in future FE management programmes. Congratulations guys - first rate job! I was honoured and privileged to be involved in this programme; working with the Deans was inspiring and humbling. Their achievements were truly impressive and more so when you learned of the hostile environment in which many of them worked, facing personal danger. The programme that Tony and Dave ran certainly gave new learning opportunities and challenges to the Deans, opening up Western managerial theories and practice to them. The motivation of the Deans for learning was tremendous and their eagerness to apply the learning in their colleges was evident. What was most impressive was the scale of their achievements in changing long-held cultural attitudes and improving standards throughout their organisations. For me what was so rewarding was the learning I was able to take from the Deans. I am certain that many UK managers would benefit from the tales of inspirational leadership found amongst this group. After decades working in and around the UK Further Education sector, and some recent years working with its leaders in a range of ways, this project comes as an inspiration indeed -- shining a clear and energising light on the relative 'challenges' involved, and the ways of addressing those. Learning about this program, it's now useful to reflect on the comparative types, degrees and impacts of knowledge, understanding and skills involved for leaders, in both of these Iraqi and UK professional worlds -- whether they are innate, acquired or yet to be developed. The contexts are remarkably different, of course. Nevertheless, it's instructive and sobering to think broadly about the issues of equality and diversity involved, and the achievement gaps that are linked to those; budget cuts alongside damage of a far greater kind; or Ofsted inspections as against searches for bombs. A tad over-dramatic, perhaps; but not without some useful truths underlying them. I would therefore very much hope that the experiences here can be digested, transformed and applied effectively here in the UK, with and for its parallel FE/VET system and personalities. The summary, articles and evaluation here are a start. There's more to do. Good luck with that, indeed, Tony and colleagues -- and bravo. Mike Thank you for your stimulating thoughts. There are indeed comparisons to be made and also contrasts to be highlighted as you have done. In the UK we cannot escape the constant media messages of economic 'gloom and doom' and whilst these issues need to be faced we remain one of the world's richest countries. Spending time in Iraq - or any other country in development - reminds us of what we do have. Leaders need to distribute hope and raise people's gaze to consider what is possible. We have much to learn from one another's culture and educational systems. I thoroughly enjoyed the two visits with the Deans from Iraq and supporting their leadership journey. Tony and the team did a fantastic job and there were so many learning opportunities on both sides as the difficulties and journeys of the Iraq Deans and the institutions were insightful. I thoroughly enjoyed delving into this translation of leadership theory and strategy into a culture that does not readily support these concepts. Dave and Tony's decision to research the roots of leadership within the culture and their sensitive approach to individuals who put there lives on the line for education was both moving and thought provoking. I would have liked to see how working with the Iraqi Deans impacted on both Dave and Tony's own attitude to leadership and if this experience has influenced the work that they do in a more Western society e.g.. Can Sprituality have an impact on a leadership programme within the UK, and how might that concept be broached. (But maybe this was not the arena for such musings). For me the stories potency stemmed from the Deans' abilities to put their learning into practice to conceptualise their own theories by fusing those that they were being taught and managing to bring their teams along with them in this process of incredible change. Having little personal experience of Iraq this gave me a view of a country not simply through the eyes of war and death counts but one of hope, respect and pride. What a wonderful and rewarding breakthrough - Well Done Guys! Dear Jane Your comments set me thinking about how my approach may have altered as a result of the experience of working in Iraq. I think the ease of discussions with Iraqi Deans about spiritual things is a reflection of the very different nature of our societies. Spirituality pervades the fabric of Iraqi society. In the UK it is a more individual expression quite often and this would be mirrored in our workplace or workshop conversations. I think I tend to go with the flow and be guided by what my clients want to talk about - aiming to be sensitive and empathic. I would say I use more anecdotes than before and work even harder on the relationship building aspects. I do share lessons and insights from Iraq in a Western setting eg in a Teach First session recently I talked about the DQP and how I once chased a Dean for their tardy submission of a Leadership Development Plan. They had dropped off the internet and I was prodding for a response. They sent me an email after about 6 weeks to explain that in the last bombings they had lost their College in collataral damage and had to relocate. No-one had been killed but there had been injuries. They apologised for their late plan submission - which by the time I had read their e-mail seemed an insignificant concern of mine in comparison. The Teach First audience heard this story and there were audible gasps as people thought about their own challenges. This is incredibly inspirational and moving, the Deans are remarkable individuals and leaders, it is humbling to witness their motivation, courage and commitment. The program organisers did a great piece of work and were SO privileged to be involved, fascinating elements to the programme that are innovative within an unusual context. Dear Lynne. Thank you for your observations which mean a great deal given your huge commitment to building leadership development capacity in the UK and elsewhere over many years. I have often felt that sense of privilege when working with the Deans and there is also synchronicity in how the various 'actors' in this story came together - facilitated initially by Ali Hadawi and Rawabit, under the UK's Centre for Excellence in Leadership which you headed up, and now with the Association of Colleges and British Council. The goodwill from multiple sources has helped fuel the successes of the programme and of its delegates. I have spoken to Tony and Dave many times over the last couple of years about the DQP having initially worked together on the UK model of the programme. This is such an inspirational story of a group of leaders whose drive to learn and develop is shaping a new and improved culture and is overcoming deep set barriers and restrictions. Hi Janine. Good to hear from you. The foundations laid in that UK model were indeed what we built the DQP on. It is fascinating to see that there are some themes of leadership which seem to travel well. The challenge is to contextualise the learning so it is accessible, culturally sensitive and relevant. At the same time it is humbling to witness people pushing out the boundaries of leadership after so much repression. 40 years ago Iraq was a shining light in the region in terms of educational achievement and the strength of its economy and I see every possibility of it returning to that place in time. Technical Education will play a key role in that. Years ago I read a quote that "hope destroys initiative" because all the energy goes into hoping instead of doing something about the issues. DQP takes the energy and turns it into on-going collaboration, initiative and skills development that helps deliver change and turns hope into reality. This is a very impressive and inspirational journey, and clearly an intense, unforgettable learning experience for all involved. I was introduced to the Change House by Tony and Dave years ago in preparation for redundancy . It continues to be useful in dealing with lifes ups and downs. Thank you Ellie for your comments about how the energy for change paradoxically could be diverted by hope if it doesn't inspire action. My sense with the Deans was that the time was right for them for change. They explained that after 2008 the security situation in Iraq improved and this created the conditions in which wider change could be explored. They had also endured the frustration of crushed hope through decades of dictatorship. I recall a quote from a wise mentor that 'frustration is the energy for change'. They had plenty of that! The Chartered Management Institute was really pleased to be involved with this excellent project. The nine Deans who obtained Chartered Manager are excellent ambassadors of professional managers and leaders. They all clearly demonstrated that they had the experience, knowledge and worked to a consistently high standard. Through this programme we learned so much about what is happening in Iraq and the leadership and management Deans have had to exhibit in such very complex and difficult circumstances. The willingness of the CMI to 'reach out' to this client group was wonderful. We learned in partnership with you and have used the joint experience gained in Istanbul to embed the evidence-gathering for cohort 2. This will make it easier both for delegates and Chartered Manager assessors next time. The face to face nature of the Chartered Manager assessment route chosen ( the 'Professional Discussion' ) was exactly the right approach in this relational society. I am looking forward to seeing the first Iraqi branch of the Institute, as the number of CMI Fellows and Members grows. This is an unusual and moving story about the rebuilding of a nation from the roots up. The challenge for UK leadership consultants to gain the trust and respect of a battered, dis-enfranchised group of intelligent individuals from a completely different culture, is massive. The report shows how Tony Nelson and his team went to great lengths to value the Deans as individuals and to give them something of lasting value with the potential to create a slow-burn cultural change. I was very fortunate to be an Assessor for the Charted Manager element of the DQP and spent 5 days with Tony Nelson, Dave Peel and the Deans in Istanbul in March 2011. The experience was moving in that all the Deans had personal stories of life in Iraq prior to the Liberation, that in several instances involved actual physical attacks and harm by militias in order to prevent the Deans continuing their work. Once again I was moved by the fortitude of the human spirit. Tony and Dave worked with Deans over many months introducing new approaches to leadership and management through coaching and mentoring new skills that will contribute to the building of a new Iraq over the coming years. Real leadership and management on the front-line. Thank you for your reflections and how quickly time flies! The multi-layered approach of assessment on DQP encouraged a deepening of the evidence offered. The Chartered Manager assessments which you and Gaynor led found strong evidence of business and strategic impact - but we were moved the most by the human stories of endurance, resilience and renewed hope. Your work in creating a psychologically 'safe' environment for delegates undergoing assessment was pivotal. A great experience to work both with the Deans and with Tony. The experiential approach provided a great challenge to the participants and Tony's deep empathy for each individual and their respective needs made this a remarkable learning experience - as the feedback demonstrates. Here's hoping for ongoing work and continued success. Dear John The experiential approach was certainly one of the counter-cultural initiatives we experimented with and all the facilitators demonstrated considerable empathy as well as curiosity about the learning opportunities. The next cohort has started already and we can apply the lessons learned to the experiential workshop in Iraq during 2012. As a PQP graduate, I fully appreciate the impact that Tony's work can have on leaders. I regularly refer to material that Tony used on the course, including the scene from Pay It Forward. My service works with large numbers of ESOL learners and so I fully understand Tony's comments about the influence of culture on learning. Undoubtedly this project will have a huge impact on the course participants and the citizens of Iraq that they will lead and influence. Dear Cath Great to hear you are still using the PQP material from the (UK) Principal's Programme. I love that video clip too, which resonates on multiple levels. congratulations on the success of your project, based on the hard work and research you undertook before commencement to establish the needs and provide of your audience. As someone who is actively involved in developing tomorrow's Arabic leader, I see this programme as best practice not only in subject matter but, equally important, how it is done. In leadership development, too much emphasis is placed on leadership and not enough on 'development'. It is too easy, and an undoubted mistake, to impose Western leadership and leadership development processes when running programmes in the Middle East. Collaborative, cross-boundary development that results from student centred, shared learning ensures that the best is drawn from all cultures. Indeed, the West has much to learn from Arabic culture in terms of leadership where values are drawn from very different sources. Thanks Dan for your comments. I know how deeply committed you are to the work of leadership development in the region and would be interested to read more of your insights about where, in Arabic culture, the values are drawn from which inform leadership. A fantastic example of leadership transformation. It is interesting to read your approach to planning the programme, your reflection and understanding of the cultural impact on learning and your approach to overcoming perceived barriers. Dear Dawn I appreciate your reflections - I think I need to start revising my 'lessons learned' as readers are spotting things I perhaps took for granted in our practice! DQP was a quantum leap reflected positively on our administrative performance and on the development of our skills in the administration so that our colleagues at work began to feel that development . DQP made ​​us able to deal with any problems face us in our institutions. Dear Tony, your efforts were very wonderful and unforgotten. Thank you very much for you and for all who have contributed in the preparation of this programme especially Dr. Mahmood who provided the ‘igniting spark’ for the programme and he is really the " Father" of DQP... Many thanks to Dr. Ali Hadawi , Mrs. Jo Clough , Dave Peel , Mr.Ian Peake and to all others who contributed in the programme . Dear Dr Aziz Thank you for your comments especially about the wider recognition. The great success of your project owes much to the extensive, historical and cultural research that you so enthusiastically undertook before commencing the course. Your ability to empathise with difference enabled you to forge respectful relationships resulting in reciprocal trust, understanding of the leaders needs and considerable learning for both. Your wish to be flexible and adapt also contributed to the successful undertaking; particularly when considering the nature of group or team work. I am Dr. Fadhil l Abdulabas (PhD Statistics / Assistant Professor) Dean Technical Institute / Kufa, One of the participants in the first DQP program (November 2009 to March 2011) was a great program and very useful, I learned with my colleagues (8 deans others) a lot of theories and concepts to lead the administrative, improve performance, diagnose the performance of staff through the house to change, Rating and self-evaluation Dean of the others. I and my colleagues we becomes Coach in the new program we are trained and completed a month before the first phase of other colleagues in the program (26 Dean and Associate Dean).